Candy Crush Quick Start Guide | Pre-views, level help, tips and videos for ALL Facebook King levels! If you do not want to see the app and play just to test Candy Crush for a minute or two, you can get a taste of the game without any registering at Royalgames. If you want to play the actual Candy Crush Saga, CLICK Here! Candy Crush Saga is available as mobile for Android, iPad, iPhone and as a Facebook Application and also some various other ways, not all Android are supporting CCS though. If you need more specific help, or want to share some Tips or Cheats for Candy Crush, please visit the Candy Crush Forum. Candy Crush have it’s own official Youtube Channel, click here to find Toffette Candie’s Youtube Channel. 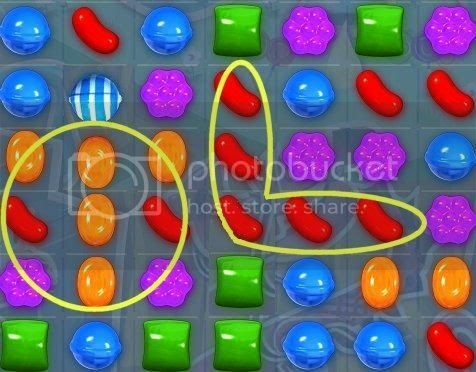 In Candy Crush Saga, you move across a saga map to different episodes with new levels. You need to clear a level, in order to progress to the next level. In the Beginning there are three basic types of levels: jelly levels, ingredient levels and timed levels. When you play Candy Crush Saga to high levels, new kind of obstacles will be added to make more challenging levels. 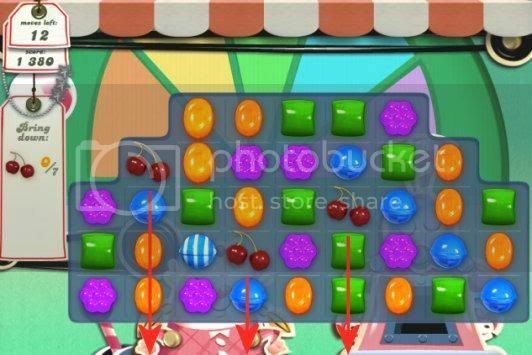 The basis of the game and each of the types of levels is as simple as it gets: move a candy in order to make a row or a column of at least 3 same-coloured candies. If you make a line or row of more than 3 candies, you will get a special candy. Aside from the timed levels, you can take as long as you want to think about your next move. The only limit the game gives you, is the amount of moves you use to reach the level’s target. Don’t rush through the levels, having an extra look at the board you are playing can save you many lives and grey hair. When you have either reached the level’s target, or the time limit is over, Candy Crush will happen. Any special candies left on the board will be activated and make extra combinations to get your score count up even higher. After clearing you first jelly Level, which is level 6, you get 3 free lollipop hammers. The Lollipop Candy hammers in Candy Crush Saga are Boosters that you can purchase with Facebook Credits after you have used the 3 free Lollipops that you first get, you buy the Lollipops Hammer Smashes 3 each time and that costs you 19 FB Credits. You find the Lollipop Hammer Booster at your Upper right hand whenever you are playing a level. In Jelly levels, the goal is to remove all the jellies from the board. A jelly is removed by making a match over the jelly’s square. Almost fully transparent squares need one match to remove the jelly, while only slightly transparent squares need two matches: one match to make it almost fully transparent and one more match to remove the jelly altogether. While you’ll spend most of the matches clearing the normal field, there are two things to always watch for: jelly squares at the top of the field, and jelly squares in odd corners of the field. As these are really hard places to match 3 in a row, you have to match whenever you get the chance, because you won’t know if there will be any more at that level. There are also stone squares: the squares don’t actually have any candies to use, but they need to be opened up. When a match is made on one of the squares next to the stone square, it will break open and can be used. In ingredient levels, the aim is to move ingredients from the top of the board to the bottom, by removing candies from underneath them. There is not much of a special strategy to these levels, other than keeping your focus on how to bring down the ingredients, rather than just making matches. Timed levels are the most straight-forward of all the types of levels: you need to reach a certain score within the time limit. Make quick decisions, go for combo’s and use as many special candies as possible to rack up that score! When a candy appears that has “+5” written on it(upper right in the Pic), use that candy in a match to get an additional 5 seconds before the timer runs out. Even if you haven’t quite reached the score when the timer runs out, fear not: Candy Crush also appears in timed levels and will give your score an extra boost. If you make a match of more than 3 candies, the candies will transform into a special candy, with special powers. There are three primary special candies, but by combining special candies you get even bigger effects. By matching 4 candies of the same color in one row or column, a Striped candy appears that, when matched, clears the entire row or column it is in. When combined with another 4-match special candy, both the row and the column it is in will be cleared. By matching candies in a long L-shape or in a T-shape, you get a Wrapped candy. When it is matched by colour, it will explode once, fall down, and explode another time, clearing loads of candies off the board. You an match a striped candy and a wrapped candy to get a HUGE striped candy that clear out 3 columns and 3 rows. If you are able to match 5 candies, you get a really special candy. This can be switched with any other single candy on the board; it doesn’t need to match to activate. When activated, all the same-colored candies as the candy it was switched with, will be removed from the board. If you combine this special candy with a 4-match special candy, all the candies of that color will change into that special candy, and clear out all the rows and columns that color is in. Take your time to think of what move to make next. Unless you’re playing a timed level, there’s no time limit. Learn to recognize when you can make a special candy. They’re very powerful items that can make the difference between finishing or failing the level. Try to combine the special candies! Only use the ‘flashing’ suggestion the game gives you if you don’t see any other matches you can make. While the suggestions helps you a little, they are usually not the highest-scoring matches you can make at any point. If you are unable to reach the level’s goal, you will lose a life. Your lives will refill up to a maximum of 5. Refilling one life takes 30 minutes. As good a player as you are, there is always that random factor that often make it very hard to pass a level. Don’t give up! Given enough attempts, you will progress. YOU CAN DO THIS! Find more videos in the PLAYLIST INDEX for Candy Crush Saga! When can we expect a fan page like for bubble puzzle? Great page! 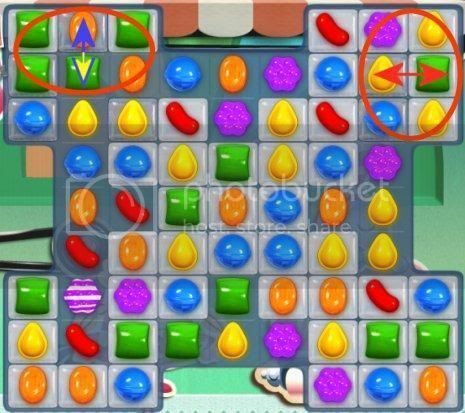 What do the different colors of the candy crush levels mean? What are the chocolate for in level 51 How do you win that one? The Chocolate is an Obstacle, you do not want that one in this game. It is much more fun in real life, LOLs. 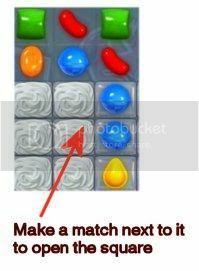 :P You remove the Chocolate by matching candies beside the chocolate. At level 51 in Candy Crush the chocolate do not reappear if you can remove it all. :) Sweet gaming. I cant get past it either, ???? Remember to click on +5 candies to get more time and try tpo make as many special candies as you manage to make. what do you need to do to pass level 20? Hi I’ve completed level 165 and can’t find the next levels please help, I play on my iPad. I love candy crush saga but it’s hard to ask for lifes all the time, some of my friends get a commercial and get lifes for free, how can I add this commercial so I must’nt quit playing all the time till I have lifes again? If you don’t get commercials it might be because you have purchased stuff in some of King.Com’s apps, once they are gone, they really don’t tend to come back I am afraid. Can I use a lollypop hammer to smash the jelly? I sometimes have 2 jelly spots left on my last move and I don’t want to waste my free lolly’s if it wont affect the jelly. I have been playing Candy Crush, but now can’t get it to load. I’ve updated my Firefox and Java, but no go. Can you help? Remove the game, clear out your cache and cookies and reinstall your game. You can also try Google chrome if that doesn’t work. I purchased extra lives, episode 3 and the chocolate bombs. How long do I need to wait and how do I access them? In candy Crush you use actual money for all the Boosters. After level 50 it’s asking for help from friends or $0.99. Have sent requests and received a response but still can’t access 51. Do I need to pay? Just resend the requests, sometimes they jam in cyberspace and aren’t recorded. my friends received my requests but can’t reply and I can’t seem to resend. Any ideas. I am sorry to tell that I hve played just lower levels, but you can ask in the forums. I’m old (60) and just started playing games. Is everything I see on boards xcandy? even hot dogs? Are only some of them jelly? Yep, everything is candy. 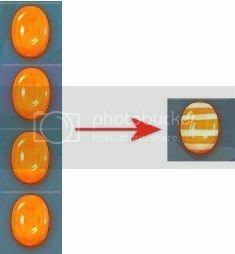 Jelly is not in all levels and only some of the candies are covered with jelly, the jelly usually have two layers, so that you need to clear the spot twice to remove the jelly. And noups, you are not old. :) Age is just a number. I too am knocking on the back door of 60, and have been trying to figure out what in the heck is the jelly. Thank you for the question and answer. Jelly is the greyish square the lollies are sitting in. Not the actual lollies themselves. How do you switch 2 candies with the big wobbly red hand? I don’t understand how to use this? 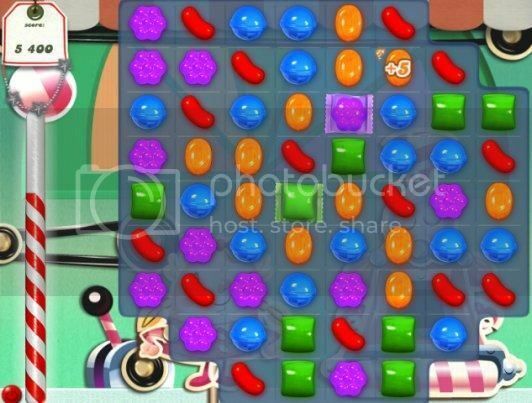 I really enjoy Candy Crush Saga , but level 86 is very frustrating . What do I do to get cleared ? And what happens to the extra lives friends send to me & the extra moves , can they be used on all levels ?? I am stuck on 86 for weeks….did you make it through? If so, what hints can you give me. I always seems to have one or two left and nothing close to get rid of them. Tks. Estoy estancada en el nivel 135!!! How come on level 20 I have both failed the level and completed the level several times. How come it wont move me to level 21? You need to pass the level first and then ask for tickets after clearing an episode. I passed level 35 but didn’t ask for tickets from my friends. Now I’m still on 35 and the target now is 250,000 vs 140,000. Any suggestions? Ask for those tickets now. The option is still there when you click/tap on the level 36 location. Wat zijn de spelregels om level 31 te overwinnen? On level 65 I had 2orange candies light up with a chocolate square but I can’t figure out how to move them and there were no other moves available in the game. How do I move the orange candies with a chocolate square? Is there some trick? Or was this a bug? I really can not tell, it seems that everyone don’t get those orange candies there. This happened to me too!!! Can anyone help us!!! On level 56 do you have to create the special candies to clear the chocolate boxes? This confuses me for some reason. You need to do double matches at those squares. What are the coins for, how do you use them. There are no coins in Candy Crush Saga. 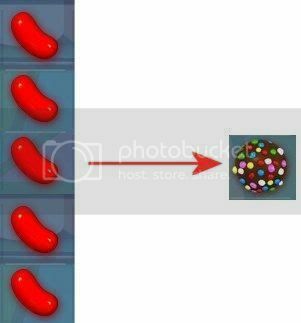 On level 51, I have a red jelly bean with a chocolate square above and another red jelly bean above this to the right. There are no other moves on the board and the above are flashing/hinting it’s the next move. How can it be, as cant move/use chocolate squares? I am on level 135 and the ask friend button will not work. It is there but when I click on it nothing happens. All other buttons work.I have tried reloading and clearing cashe,history,etc. Nothin has worked. there is no “ask friends” option after 135 i candy Crush Saga, are you talking baou Bubble Witch Saga? If so, please try to load the game in another browser to get the action completed. Does anyone know what the colors of completed levels mean? Some of my completed levels are orange, some are blue and some are green. And they don’t correspond to the number of stars for each respective level. It is jelly and timed levels. … but, I think that behaviour might be different on some level? When I open the game on Facebook there is a mail pop up for me to accept lives from my friends. When I accept them where do they go? I can’t seem to collect any of them? If my lives are full I get no more. If I close the pop up I can’t get it back again. I’ve read that after I use some lives I can collect them from an on screen envelope. My game has no envelope? What is the point of asking friends to send me lives when I can never collect them? fo not accept till you’re below 5 lives ! I cannot move on from level 35, as I receive a message that I need help from Facebook friends. I do not use Facebook, so how do I move on?. Ask in the Candy Crush Saga Forums please. Playing candy crush at a level I need to ask friends and the but on won’t work. Everything else works. I have been told to reoad the program. If I do that will I have to start over at level 1 again? If you are connected to Facebook, your progress will restore when you reconnect to Facebook. Cannot figure out level 31. How are the jellies smashed on this level? Even tho the colors line up across the top of all the boxes, the jellies don’t disappear. Help would be great appreciated!!!! What r the heart envelopes that you see next to your friends pictures when you start a new board? I click on those envelopes all the time and nothing happens. Am I sending recieving or just being a damn fool for clicking? Apparently this is the answer: when you click on the heart envelope it sends a life to the person and prompts them to send you one back. Yes, you have figured that out quite right.